Donation after circulatory death (DCD) donors are an important source of kidneys for transplantation, but DCD donor transplantation is less common in the United States than in other countries. In this study of national data obtained between 2008 and 2015, recovery of DCD kidneys varied substantially among the country’s 58 donor service areas, and 25% of DCD kidneys were recovered in only four donor service areas. Overall, 20% of recovered DCD kidneys were discarded, varying from 3% to 33% among donor service areas. 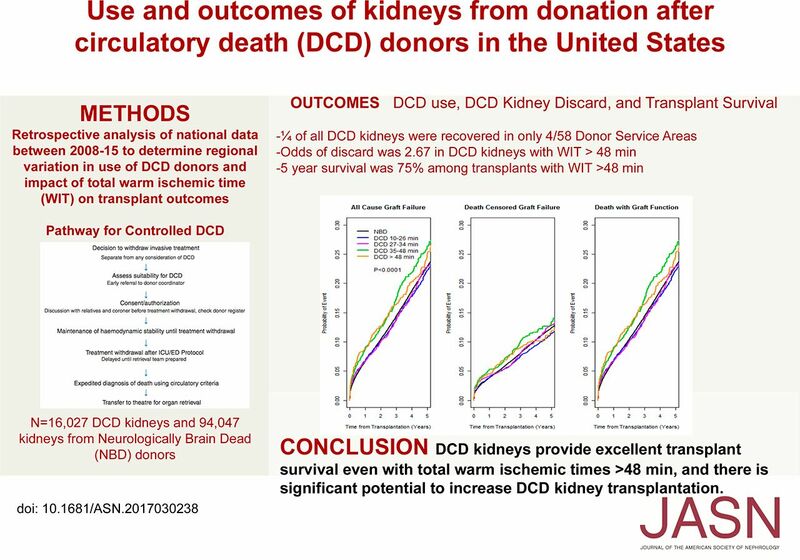 Compared with kidneys from neurologically brain dead (NBD) donors, DCD kidneys had a higher adjusted odds ratio of discard that varied from 1.25 (95% confidence interval [95% CI], 1.16 to 1.34) in kidneys with total donor warm ischemic time (WIT) of 10–26 minutes to 2.67 (95% CI, 2.34 to 3.04) in kidneys with total donor WIT >48 minutes. Among the 12,831 DCD kidneys transplanted, kidneys with WIT≤48 minutes had survival similar to that of NBD kidneys. DCD kidneys with WIT>48 minutes had a higher risk of allograft failure (hazard ratio, 1.23; 95% CI, 1.07 to 1.41), but this risk was limited to kidneys with cold ischemia time (CIT) >12 hours. We conclude that donor service area–level variation in the recovery and discard of DCD kidneys is large. Additional national data collection is needed to understand the potential to increase DCD donor transplantation in the United States. Strategies to minimize cold ischemic injury may safely allow increased use of DCD kidneys with WIT>48 minutes. Given the increasing importance of DCD donors, we undertook this study to determine contemporary use and outcomes of DCD donor kidneys for transplantation in the United States and specifically focused on the effect of total donor WIT (defined as time from withdrawal of life-sustaining therapy (WLST) to the initiation of cold perfusion) (Figure 1) and DSA-level practice variation. The controlled DCD procedure showing metrics of ischemic injury, including (1) total donor WIT calculated from the time of WLST to the initiation of cold perfusion, (2) functional WIT defined from onset of sustained hypotension and hypoxia to initiation of perfusion, (3) time to death defined from WLST to declaration of death, and (4) agonal phase defined from onset of sustained hypotension and hypoxia to cessation of circulation. The no touch period is typically of 5 minutes in duration. Between January 1, 2008 and December 2, 2015, there were n=16,027 kidneys recovered from DCD donors ≥20 kg (n=107 kidneys from DCD donors <20 kg were excluded from study). Among the n=58 DSAs, the number of DCD kidneys recovered varied from 0 to 1072 (median =216), 25% of DSAs recovered fewer than ten DCD kidneys per year, and 25% of all DCD kidneys were recovered in only four DSAs. Among DSAs that recovered at least one DCD kidney, the proportion of kidneys recovered from DCD donors varied from 1% to 32% (median =13%; quartile 1, quartile 3 =8, 19) between DSAs (Figure 2). Variation in the proportion of DCD kidneys. The proportion of kidneys recovered from DCD donors varied from 1% to 32% (median =13%; quartile 1, quartile 3 =8, 19) between the 57 DSAs that recovered at least one DCD kidney during the study period. Table 1 compares selected DSA characteristics between DSA quartiles defined by the proportion of DCD donors among all deceased donors identified in the DSA during the study period. The time between the date of hospital referral of a potential donor to the organ procurement organization (OPO) and date of declaration of death was clinically similar in DSA quartiles ranked by the proportion of DCD donors. The donor conversion rate, defined as the proportion of eligible donors converted to actual NBD donors, was also similar between DSAs quartiles. The proportion of DCD donor kidneys shipped outside the DSA for transplantation was higher in DSAs with a lower proportion of DCD donors during the study period. Among recovered DCD kidneys, n=3196 (20%) were discarded. In comparison, n=17,221 of the 94,047 (18%) recovered NBD kidneys were discarded (P<0.001). The proportion of DCD kidneys discarded in a DSA varied between 3% and 33% (Figure 3) and was related to the proportion of NBD kidneys discarded within individual DSAs (Pearson correlation coefficient =0.61; P<0.001). In 34 of 58 DSAs, the DCD discard rate was higher than the NBD discard rate (denoted by the black circles in Figure 3). 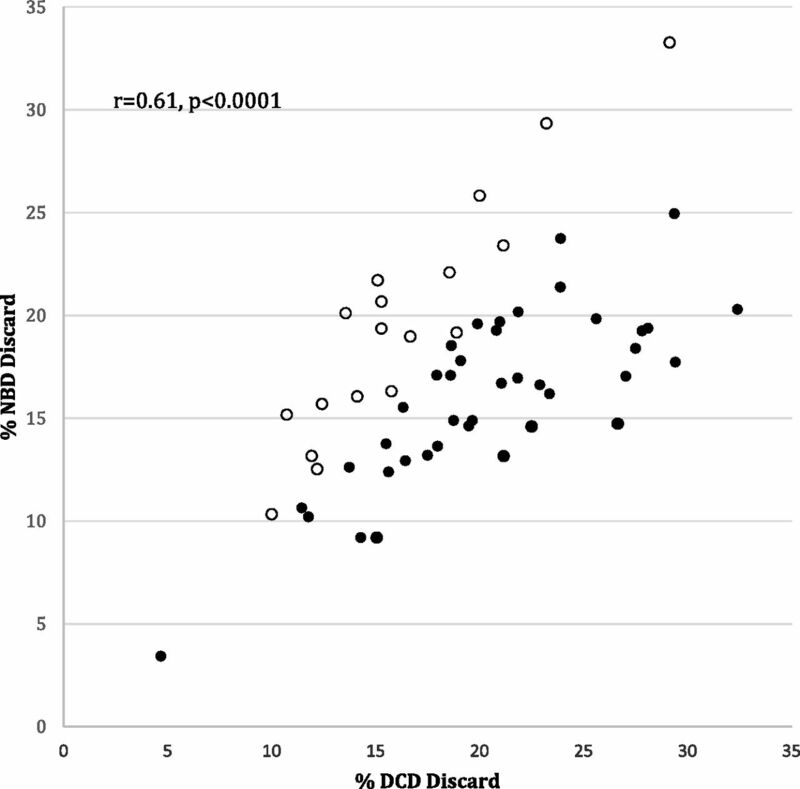 The proportion of DCD donor kidneys discarded was correlated with the proportion of NBD donor kidneys discarded within DSAs (Pearson correlation coefficient =0.66; P=0.001). DSAs in which the proportion of DCD kidneys discarded was greater than the proportion of NBD kidneys discarded are denoted by black circles. Table 2 shows the proportion of DCD kidneys discarded in the DSA at the 10th and 90th percentiles of discard in subgroups defined by total donor WIT, kidney donor profile index (KDPI), use of machine perfusion, and use of donor biopsy. Discard was more variable among donor kidneys with a longer total donor WIT, kidneys with higher KDPI, kidneys not treated with machine perfusion, and kidneys evaluated by biopsy. Table 3 compares the proportion of DCD and NBD kidneys discarded. In the first, second, and third KDPI quartiles, the proportion of DCD discards was higher than the proportion of NBD discards, suggesting that DCD kidneys may have been considered inferior to NBD kidneys with the same KDPI, although DCD is accounted for in the calculation of the KDPI, and DCD kidneys otherwise have more favorable donor characteristics than NBD donor kidneys with the same KDPI. Considering individual factors, the proportion of DCD discards was higher in most subgroups, with the largest difference in DCD versus NBD discard observed among hepatitis C antibody–positive donor kidneys and kidneys not treated with machine perfusion. The proportion of DCD versus NBD discards did not differ in subgroups defined by factors associated with an increased risk of DGF or allograft failure, such as donor age ≥65 years old, terminal serum creatinine >1.5 mg/dl, donor history of hypertension, or diabetes. Kidneys evaluated by a biopsy were the only subgroup in which the proportion of DCD discards was lower than the proportion of NBD discards. A longitudinal increase in DCD versus NBD discard was not observed, and the proportion of DCD discards did not increase over time in any of the subgroups examined (data not shown). The total donor WIT could not be calculated for n=560 DCD kidneys. Among the 15,467 kidneys for which total donor WIT could be calculated, the times ranged from 10 to 174 minutes, and the 50th, 75th, and 90th percentiles of WIT were 26, 34, and 48 minutes, respectively. Time to death (calculated from time of withdrawal to time of death) (Figure 1) was a median of 69%, and quartile 1, quartile 3 = 57, 81 of the total donor WIT. The proportions of DCD kidneys discarded with total donor WIT of 10–26, 27–34, 35–48, and >48 minutes were 16%, 20%, 25%, and 29%, respectively. Table 4 shows that DCD kidneys had a higher-adjusted odds of discard compared with NBD kidneys and that the odds of discard were higher in DCD kidneys with longer total donor WITs. Figure 4 shows that the higher odds of discard among DCD kidneys compared with NBD kidneys varied between KDPI subgroups by total donor WIT. When total donor WIT was >48 minutes, DCD kidneys had higher odds of discard in all KDPI subgroups. With the exception of kidneys in the KDPI 0%–25% group, the threshold of total donor WIT associated with a higher odds of DCD kidney discard was 27 minutes (the 95% confidence interval for kidneys with total donor WIT 27–34 minutes and KDPI 76%–100% crossed 1.0 because of a limited number of kidneys in this group; n=334). 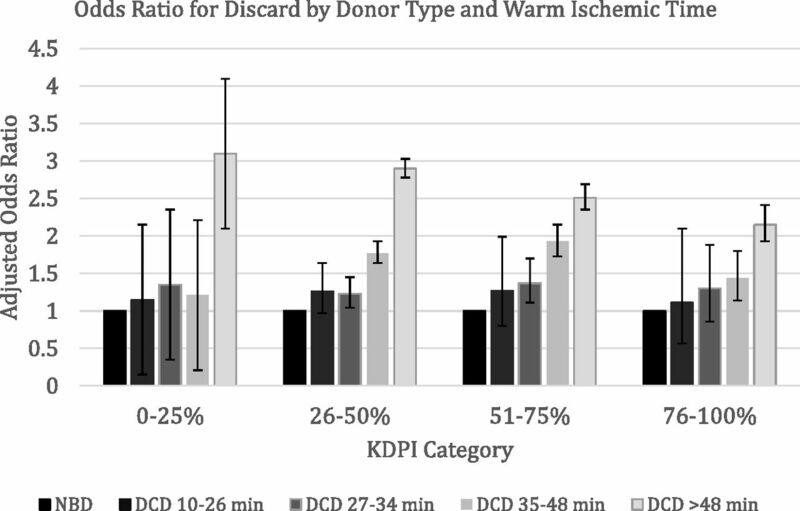 DCD kidneys with total donor WIT >27 minutes had a higher adjusted odds of discard compared with NBD donor kidneys when the Kidney Donor Profile Index (KDPI) ≥ 26%. Table 5 shows factors associated with DCD kidney discard after accounting for DSA-level variation in discard practices. Longer total donor WIT, donor age ≥18 years old (compared with donors 12–17 years old), women donors, body mass index <25 kg/m2, donor hypertension, diabetes, nontraumatic cause of death, terminal serum creatinine >1.5 mg/dl, hepatitis C antibody positivity, use of donor biopsy, and nonuse of machine perfusion were associated with a higher odds of discard. The cumulative incidence of all-cause graft loss (ACGL), death-censored graft loss (DCGL), and death with a functioning graft (DWFG) in DCD donor recipients grouped by total donor WIT compared with NBD donor recipients is shown in Figure 5. In these unadjusted analyses, the incidence of ACGL and DWFG was higher in patients who received a DCD donor transplant with total donor WIT of 34–48 and >48 minutes. The 1-year cumulative incidence rates of ACGL in DCD recipients with total donor WIT 34–48 and >48 minutes were 9.0% and 8.9% compared with 6.7% in NBD recipients (including the 3.3%, 3.1%, and 2.2% of patients who had primary nonfunction in each of these groups, respectively). 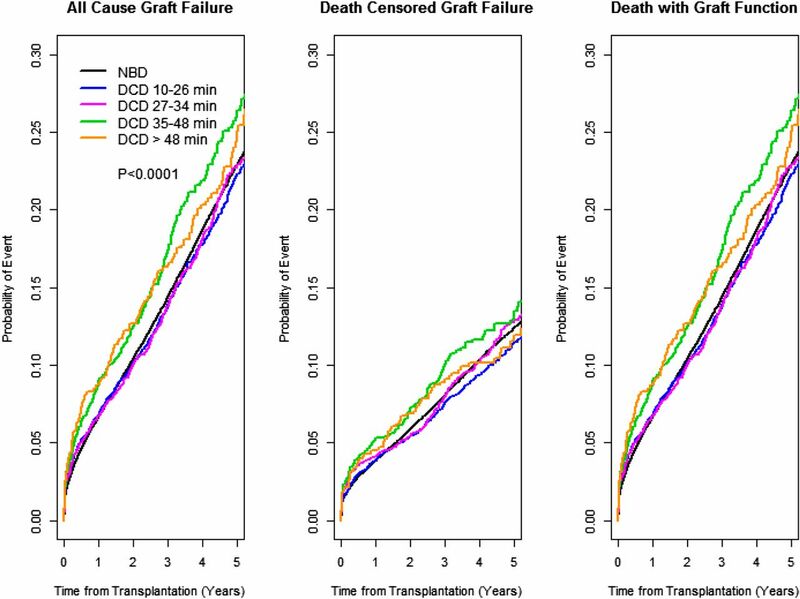 The incidence of all cause graft failure, and death with a functioning graft was higher in patients who received a DCD donor transplant with total donor warm ischemic time of 34–48 and > 48 minutes. Cumulative incidence curves including 76,826 NBD kidney transplant recipients. The numbers of DCD recipients in subgroups with total WIT 10–26, 27–34, 34–48, and >48 minutes were 6555, 3160, 1680, and 1044, respectively. Table 6 shows that there was no difference in adjusted risk of ACGL, DCGL, or DWFG in DCD donor recipients with total donor WIT ≤48 minutes compared with patients who received an NBD donor transplant. DCD recipients with total donor WIT >48 minutes had an increased risk of ACGL and DWFG but were not at increased risk for the outcome of DCGL compared with NBD donor recipients. Of interest, the n=1035 DCD recipients with total donor WIT >48 minutes were not at increased risk of ACGL when cold ischemia time (CIT) was <12 hours (hazard ratio, 1.17; 95% confidence interval, 0.84 to 1.62) but were at increased risk for ACGL when CIT was ≥12 hours (hazard ratio, 1.25; 95% confidence interval, 1.07 to 1.45; P=0.02 for the interaction of DCD recipients with total donor WIT >48 minutes × CIT). We were unable to determine the adjusted risk of ACGL in the subgroup of DCD recipients with total donor WIT >48 minutes who were also treated with machine perfusion due to the small number of patients in this group (n=177). The association of total donor WIT >48 minutes with ACGL was consistent in subgroups with KDPI≥26% (Table 7). The study identifies opportunities to increase the utilization of DCD donor kidneys for transplantation but also highlights the need for additional national data to improve understanding of DCD donor kidney utilization. We found dramatic DSA-level variation in both the recovery of DCD kidneys and the discard of recovered DCD kidneys. Understanding of the reasons for the DSA-level variation in the recovery of DCD donors remains incomplete in our analysis. Failure to wait for patients with severe brain injury to progress to neurologic brain death could inflate the proportion of DCD donors; however, we found no evidence that this was a factor contributing to the observed DSA-level variation in use of DCD donors. We also did not find an association between OPO performance in recovery of NBD donors and recovery of DCD donors. 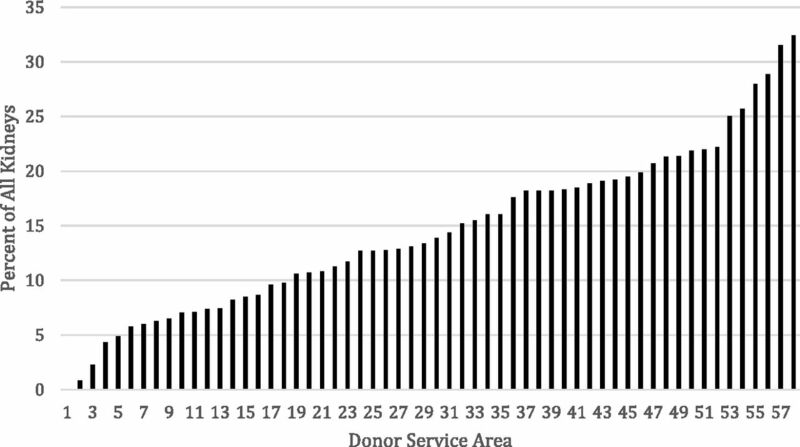 DSAs with lower utilization of DCD donors more frequently shipped DCD donor kidneys to transplant centers outside their DSA, suggesting that regional differences in acceptance of DCD donor organs contribute to differences in the use of DCD donors. Further studies are needed to understand the DSA-level variation in DCD donors observed in our study. Compared with NBD kidneys, DCD kidneys had a higher odds of discard; the odds of discard were greatest in DCD kidneys with total donor WIT >48 minutes, but DCD kidneys with shorter total donor WITs also had a higher odds of discard in subgroups with KDPI>25%. Total donor WIT was independently associated with DCD discard, but among DCD kidneys used for transplantation, only those with total donor WIT >48 minutes were at increased risk of allograft failure; also, there was no evidence that total donor WIT had a differential effect on allograft failure in kidneys of different quality defined by KDPI quartile. The increased risk of allograft failure in DCD kidneys with total donor WIT >48 minutes was limited to patients with CIT>12 hours, suggesting the importance of strategies to limit CIT. Our study determined WIT from the time of withdrawal of WLST until the onset of cold perfusion (also known as the total donor WIT),7 which should be differentiated from functional WIT that attempts to capture the onset of significant ischemia injury to donor organs by the use of vital signs, such as a sustained drop in the donor’s BP or hypoxia (Figure 1). The threshold of BP and oxygenation at which organs sustain significant ischemic insult is likely affected by a variety of factors, including the age of the donor, leading to a variety of definitions of the functional ischemic time in the literature.8–11 Although the SRTR reports the estimated functional WIT, these data are not validated and defined by sustained onset of unstable physiologic parameters that often fluctuate and may render the data inaccurate. We, therefore, elected to use the total donor WIT, because it is reliably defined from the time of WLST. Current recommendations suggest that total donor WIT should not exceed 60 minutes for kidney transplantation.12,13 However, these recommendations assume the onset of significant ischemia rapidly after WLST (Figure 1), which may or may not occur in individual potential DCD donors. It is important to recognize that the total donor WITs reported in this study may include periods of time when the donor organs were not subject to significant ischemic insult. There is limited evidence that functional WIT may be a more important determinant of transplant outcome than total donor WIT.10 However, the upper limit of functional WIT compatible with successful kidney transplantation remains uncertain. Reid et al.14 reported that an agonal phase duration up to 60 minutes (i.e., the time between the onset of hemodynamic and respiratory instability until circulatory arrest in Figure 1) was not associated with an increased risk of adverse outcomes, including DGF and lower kidney allograft function, at 12 months. Recent studies have suggested that examination of donor hemodynamic factors after WLST may be useful in predicting post-transplant outcome.15 The upper limit of functional WIT compatible with successful kidney transplantation is likely higher than for extrarenal organs, because kidneys maintain perfusion in the setting of hypotension through autoregulation. The implications of this fact are that implementation of a uniform upper time limit of functional WIT for utilization of all organs may result in nonrecovery of viable DCD kidneys. Our study highlights the need for improved national data collection as well as dedicated studies to define the upper limit of functional WIT compatible with kidney transplantation. Our analysis is limited to kidneys that were recovered and does not capture potential DCD donors who did not progress to circulatory arrest in a timeframe feasible for organ donation. There is significant variability in the time to cessation of circulatory function in prospective DCD donors.16 Most DCD protocols in the United States recommend a maximal period of 60 minutes from WLST to circulatory arrest.7,12 Potential donors may maintain hemodynamic stability for significant periods of time after WLST. Therefore, the 60-minute limit on the basis of practical considerations, including the feasibility of reserving valuable health care resources such as surgical teams and operating room resources, may lead to premature discontinuation of DCD withdrawal protocols and nonrecovery of transplantable kidneys. In a single-center analysis from the United Kingdom, a protocol of extending the minimum waiting time after WLST from 1 to 4 hours resulted in a 30% increase in DCD kidney transplantation.14 In a recent study of nearly 300 DCD kidney transplants at the University of Wisconsin, extending the waiting time from WLST to declaration of death to 2 hours resulted in 9.8% more transplants.17 The current SRTR OPO performance metrics evaluating the conversion of potential donors to actual donors are limited to NBD donors. The large DSA-level variation in the recovery of DCD kidneys in our study highlights the need for additional national data capture including potential DCD donors who do not progress to circulatory arrest during the current 60-minute time limit to fully understand the opportunity for increasing the utilization of DCD kidneys for transplantation in the United States. Despite a higher incidence of DGF, DCD kidney transplant function and survival are generally reported as comparable with those from NBD donors.18–21 Our findings extend these observations by examining the effect of total donor WIT on DCD transplant outcomes. The study findings of a minimal effect of total donor WIT on kidney transplant outcomes until total donor WIT exceeded 48 minutes and the absence of a differential effect of total donor WIT on outcomes in kidneys of varying quality are provocative but should be interpreted with the understanding that these observations are among kidneys that were carefully selected for transplantation. The observation that the association of total donor WIT >48 minutes with allograft failure was mitigated in patients with CIT<12 hours challenges current recommendations that CIT be limited to 24 hours for DCD kidneys.12 Previous work has shown that DCD kidneys tolerate CIT poorly, and strategies to minimize CIT to <12 hours may lead to increased utilization of DCD kidneys.22,23 We did not find a differential effect of total donor WIT >48 minutes on allograft survival in kidneys with higher KDPI, suggesting that there is potential to safely increase utilization of high-KDPI kidneys with total donor WIT >48 minutes. In summary, there was large DSA-level variation in the recovery and discard of DCD kidneys in the United States. DCD kidneys had a higher odds of discard compared with NBD kidneys, and longer total donor WITs were associated with DCD discard. However, only total donor WIT >48 minutes was associated with a modest increased risk of allograft failure, and this risk may be modified by limiting CIT to <12 hours. Overall, DCD kidneys provided excellent allograft survival, with 5-year survival of 75% even among kidneys from donors >48 minutes. Improved national data collection is needed to inform future strategies to increase kidney transplantation from DCD donors in the United States. This study was approved by our hospital research ethics board and adheres to the Declaration of Istanbul. This analysis is on the basis of data from the SRTR from January 1, 2008 to December 2, 2015. The SRTR data system includes data on all donors, waitlisted candidates, and transplant recipients in the United States submitted by the members of the Organ Procurement and Transplantation Network (OPTN). The Health Resources and Services Administration, US Department of Health and Human Services provides oversight to the activities of the OPTN and SRTR contractors. Only kidneys from deceased donors weighing ≥20 kg (>99% of total donor population) were included in this analysis. The study included n=356 kidneys from n=712 (2%) uncontrolled DCD donors. Survival analyses excluded multiorgan and dual transplant recipients. The SRTR reports information to allow the calculation of the total donor WIT defined as the time from WLST until the time when core cooling is initiated (Figure 1). DSA is an area designated by the Centers Medicare and Medicaid Services to be served by a single OPO. A deceased donor kidney was considered discarded if it was recovered for the purposes of transplantation but was not used for transplantation. Dual kidney transplants (i.e., the transplantation of two kidneys into a single donor) were not counted as discards. Primary nonfunction was defined by the outcome of death-censored allograft failure within 90 days of transplantation. The number and proportion of DCD donor kidneys among all deceased donor kidneys recovered for transplantation in each of the 58 DSAs were determined. To understand the DSA-level variation in the use of DCD donors, DSAs were grouped into quartiles on the basis of the proportion of DCD donors among all deceased donors recovered in the DSA during the study period. To determine if differences in waiting for potential donors to progress to neurologic brain death contributed to DSA-level variation in DCD donation, the time (in days) between hospital referral to the OPO and declaration of death was compared between DSA quartiles. To determine an association between OPO performance in NBD donation and DCD donation, we compared the donor conversion rate (the proportion of eligible donors converted to actual NBD donors) reported by the SRTR in 2013–2015 between DSA quartiles. Finally, to determine if acceptance of DCD donors by transplant centers within the DSA contributed to the DSA-level variation in DCD donors, we compared the proportion of DCD kidneys shipped outside the DSA between DSA quartiles. We plotted the proportion of DCD and NBD donor kidneys discarded in each DSA and determined the correlation between DCD and NBD discard within DSAs using the Pearson Correlation Coefficient. The effect of DSA-level discard practices was determined by comparing the proportions of kidneys discarded in DSAs within the highest and lowest deciles of discard in subgroups defined by total donor WIT, KDPI, use of machine perfusion, and use of a donor kidney biopsy. The number and proportion of DCD and NBD kidneys discarded were determined in strata defined by donor age (<12, 12–17, 18–39, 40–49, 50–59, 60–64, or ≥65 years old), donor body mass index (<25, 25–29.9, or ≥30 kg/m2), donor race (black or nonblack), donor history of hypertension, donor history of diabetes, donor cause of death (cerebrovascular accident, anoxia, head trauma, or other), donor preterminal serum creatinine (≤1.5 or >1.5 mg/dl), donor hepatitis C antibody positivity, year of donation, use of machine perfusion, and the use of a donor kidney biopsy. In addition, we determined the number and proportion of DCD kidneys discarded in categories of total donor WIT. Categories of total donor WIT were determined on the basis of the underlying distribution of the total donor WIT for DCD kidneys: The cut points of 26, 34, and 48 minutes reflect the 50th, 90th, and 95th percentiles of total donor WIT. The adjusted odds ratio of discard of DCD kidneys compared with NBD kidneys was determined in a generalized linear model using the logit link. These models account for correlation in use between kidneys from the same donor.24 The regression models adjusted for differences in individual factors within the KDPI equation (donor age, race, diabetes, hypertension, cause of death, hepatitis C antibody positivity, preterminal serum creatinine, body mass index in kilograms per square meter, year of donation, use of machine perfusion, and use of a donor kidney biopsy). Similar models were used to determine the adjusted odds ratio of discard of DCD kidneys in successively longer categories of total donor WIT compared with NBD donor kidneys. Additional subgroup analyses were stratified by quartile of the KDPI. Cumulative incidence curves were used to determine the time to allograft failure from ACGL, DCGL, and DWFG in DCD transplant recipients stratified by total donor WIT compared with NBD kidneys. Group differences were determined by the log rank test. For all Cox models, variables with missing data were assigned a category of missing, and the proportional hazards assumptions were tested using log-negative-log plots of the within-group survivorship probabilities versus log time. All analyses were performed in SAS 9.4 (Cary, NC). John Gill is supported by a Foundation Grant from the Canadian Institutes of Health Research.